For our full thoughts on How to Train Your Dragon 2, please check out Aaron Pecks' 2014 Blu-ray review by clicking HERE. Set five years after the events of the first film, part two sees Hiccup grappling with becoming a leader as his village and dragon friends are threatened by a powerful madman. A more adult movie than part one, part two trades wonder and coming of age for complex and dark emotions as well as grownup concepts like no-win scenarios. 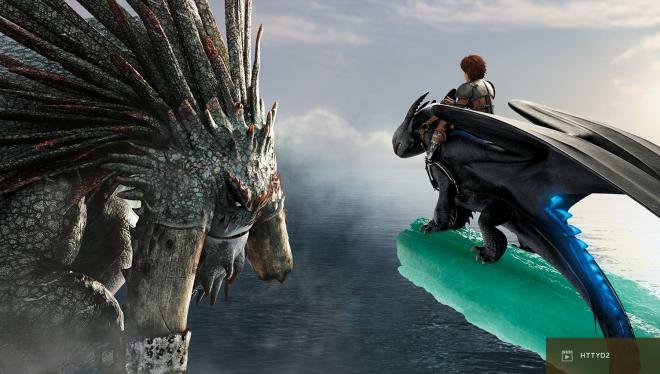 It's a harder movie to watch, especially if you have little ones, but ultimately an equally compelling one because of how Hiccup and Toothless grow their bond. Toothless is not simply a pet dragon, but a friend and an equal. In that sense, thematically speaking, the Vikings aren't simply training dragons, but rather forming mutually-beneficial relationships that will help each kind prosper. Plus, Dragon 2 delivers the goods on action, adventure, and remarkable visuals, proving that modern blockbuster filmmaking can be smart, moving, thrilling, and beautiful all at once. 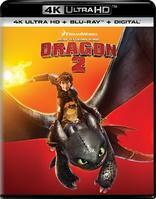 How to Train Your Dragon 2 rides back to home video as a 4K Ultra HD + Blu-ray + Digital Combo Pack. The included Blu-ray appears to be a reprinting of the previous 2014 Blu-ray. The included digital copy redeems via UniversalRedeems.com, which takes you to Movies Anywhere and syncs with iTunes, Amazon, Vudu, Google Play, Microsoft, and FandangoNow. The digital version does include 4K HDR10 rights, but, alas, there's no DTS:X or Dolby Atmos. How to Train Your Dragon 2 flies onto Ultra HD Blu-ray with a colorful and contrasty 2160p HEVC encode featuring HDR10. While the first film's leap from HD to 4K was more obviously an upgrade, HTTYD 2's improvements are a little more on the subtle side. During my first few a-to-b comparisons, the 4K Blu-ray's contrast and black levels first caught my eye; the new HDR10 grading is slightly darker than the Blu-ray, which swallows shadows and shaded areas on Toothless' black scales. This also makes cloudy skies look a little more, for lack of a better word, ominous. Still, the benefit to this comes in the brightest areas of screen -- things like clouds and dragon fire -- which are more defined. When looking at things like fine details and colors, the original Blu-ray remains a high-quality HD disc that upscales nicely on 4K displays. As such, you're not going to see a huge difference in terms of sharpness and resolution, especially in wider shots. But any time there's a closeup of a character or a dragon, the 4K Ultra HD Blu-ray reveals more skin and scale texture of faces and bodies. Hair too seems a little sharper, at the expense of aliasing around individual strands (see Stoick's beard). Still, depending on the shot, the 4K Blu-ray delivers the resolution goods. Colors too are mildly improved, especially when you're in the dragons' underground nest, or when a Bewilderbeast breathes green ice. At the end of the day, Dragon 2 may not be a 'yuge upgrade over the original Blu-ray, visually, but there are improvements and it's a marvelously gorgeous movie from start to finish. Pure eye candy all around. How to Train Your Dragon 2 stomps and whooshes and roars onto 4K Ultra HD Blu-ray with a reference-quality DTS:X sound mix that bests the already-impressive 7.1 DTS-HD MA track found on the original Blu-ray. Unlike the video where you have to look a little closer at times to see improvements, Dragon 2's DTS:X mix is an authoritative upgrade from start to finish. 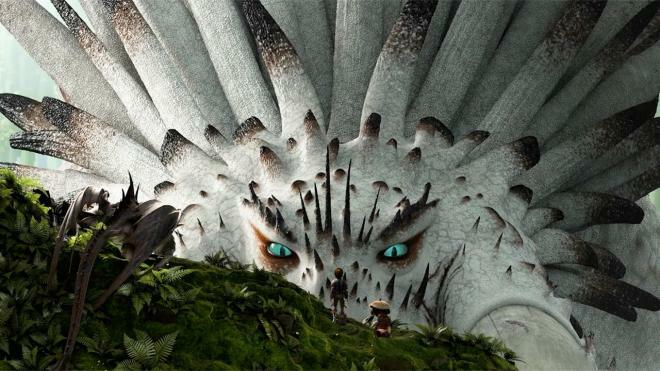 Even when paring the 7.1 track with DTS:Neural:X, it can't match the overall immersion and effects panning achieved with this new, native track, which places lots of flying dragons, environmental sounds, and John Powell's music all around and above the audience. And if you're into big bass, this DTS:X mix delivers on that too, providing more guttural thuds and roars than the mix on the first movie (which also sounds great, but not THIS great). Everything from the dialog to the music to the sound effects to so expertly mixed and defined and placed, my ears were in awe of the sound team who managed to make great... better. Well done. How to Train Your Dragon 2 features one bonus feature -- the filmmakers' commentary -- on the 4K Ultra HD Blu-ray. The rest of the special features can be found on the Blu-ray. They appear to be identical to the 2014 release, which you can read about HERE. How to Train Your Dragon 2 is a more complex story that builds upon the world created in the first film. While I prefer the original, there's a lot to chew on here from a thematic, character, story, and visual design perspective. As a 4K Ultra HD Blu-ray, HTTYD 2 delivers a 4K HDR10 presentation with a mild uptick in fine details and colors as well as a deafening DTS:X soundtrack that's among the format's finest. Special features remain the same. Highly Recommended for fans.